Who uses patty pans for cupcakes when they make such great flowers! Fringing is a great technique – simple but so effective! 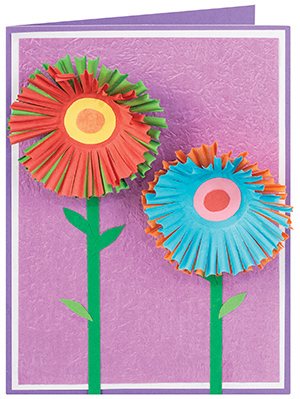 These cards are a great activity for younger children, practicing their scissor skills. Simply cut the edges of the patty pans in small increments, using the dimples as a guide, up to the fold at the bottom of the patty pan. 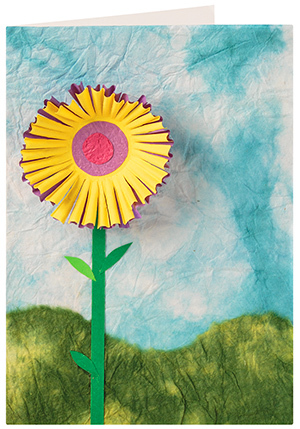 Make the flower centres and stems with cover paper. Collage some paper in the background and adhere the flower pieces on the top. Draw scenery in the background like a sky, birds, trees, people, houses, etc. Add glitter glue as a finishing touch to make this card extra special for Mum. Use alphabet stickers to write a message to Mum.